Chicago’s storefront theater scene offers edgy and intimate experiences at very affordable ticket prices. While you may trade in the scenic spectacle of, say, a Broadway show, in return you get powerful ensemble acting and ambitious storytelling. Here is a trio of storefront shows I’ve caught recently that more than deliver on our special brand of Chicago storefront theater. And if you can identify the theme amongst these three selections, bonus points for you! Pay grades, insurmountable credit card debt, recession, excessive consumerism, love. One of these things is not like the other. However, in Dennis Kelly’s efficient and horrific 90-minute play, he examines the danger of having all these themes play together, and the catastrophe that ensues. Steep Theatre’s compact play packs a punch, so hop on the Red Line north to this award-winning storefront space to see what all the fuss is about. Who knew a play about the destruction of society due to our consumer-driven lifestyle could be so darned entertaining? Brett Nuveu’s outlandish new play, which is receiving its world premiere at A Red Orchid Theatre, takes us into a top-secret boardroom where a high-strung inventor nervously prepares to pitch a product that will change the face of the world as we know it – or so he says. Just wait ‘til you see what his discovery entails. Yup: it’s a play about one of America’s largest corporate disaster stories. Lucy Prebble’s ambitious play makes its Chicago premiere at TimeLine Theatre Company, and it’s a marvel. While some might think Prebble’s theatrical framing of Enron’s downfall is overly simplified – derisive, even – I found it a mostly clever dramatization of corporate greed, finger pointing and deeply unethical behavior. 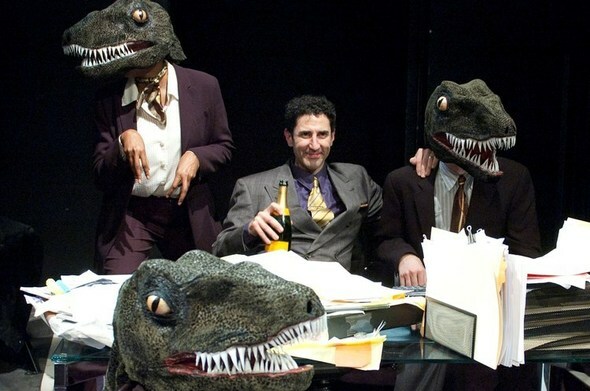 Director Rachel Rockwell freely uses visual metaphor and choreography to carry us from boardroom to trading floor to raptor attacks (yes, you read that right). This entry was posted in Arts/Culture/Entertainment, Theater and tagged A Red Orchid Theatre, chicago, Steep Theatre, theater, theatre, TimeLine Theatre. Bookmark the permalink.